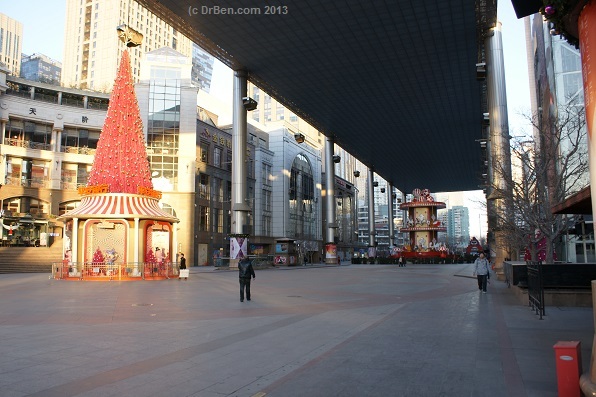 Welcome to China Report's Digital Introduction to the The Place Shopping Mall in the Chaoyang District of Beijing. 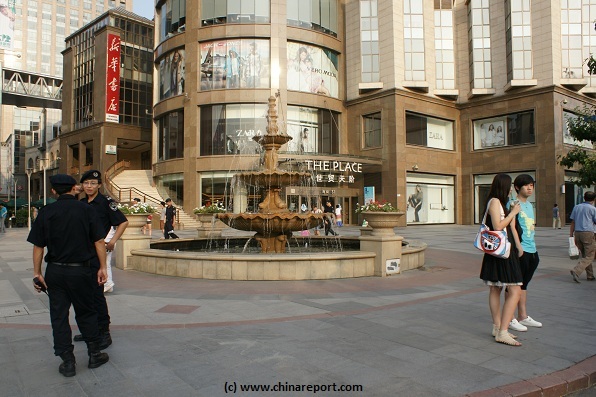 What better name to chose for the most fashionable luxury and upscale mall in the CBD of Chaoyang District? 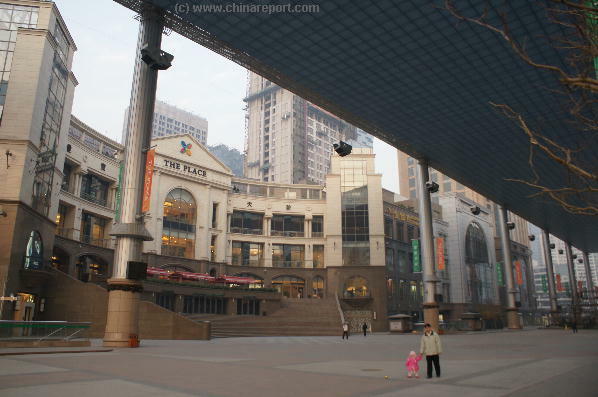 Indeed, the name The Place seems suitable for a luxury shopping mall that advertises itself via the largest color TV screen in the wider area, plus stands at a particularly strategic location in one of the most fun and vibrant parts of the huge Chaoyang District. 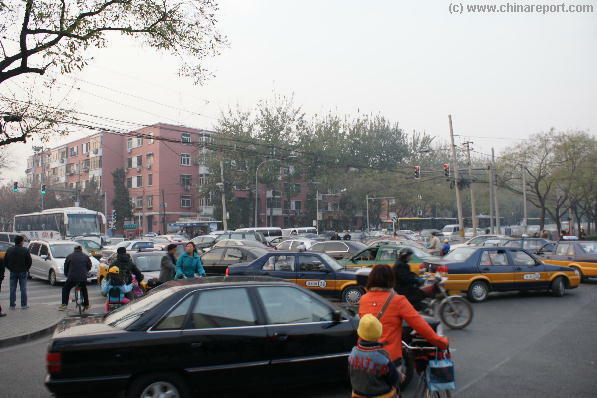 Modernity and development have also brought a new woe to Beijings City Streets: Taxis, Private Cars and mothers with children battle for driving space in front of the Place in Chaoyang CBD (Photo: November 2007). Chaoyang and the City of Beijing. The new Era meaning Beijing, crowned by the Olympic Event, becoming a true world Capital, in political, economical and even social sense, and Chaoyang Beijing the modern international and commercial heart of it all. 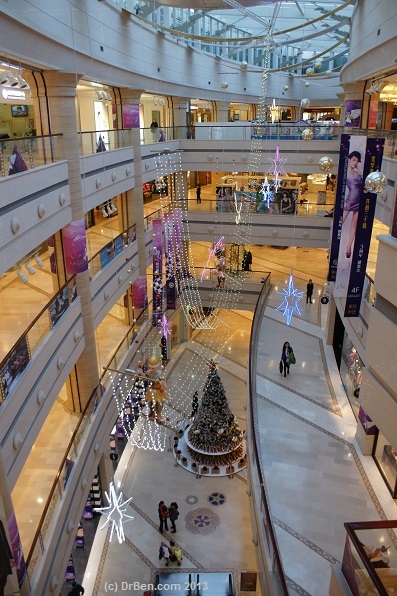 The Mall itself offers high class, high quality shopping and some excellent eating. 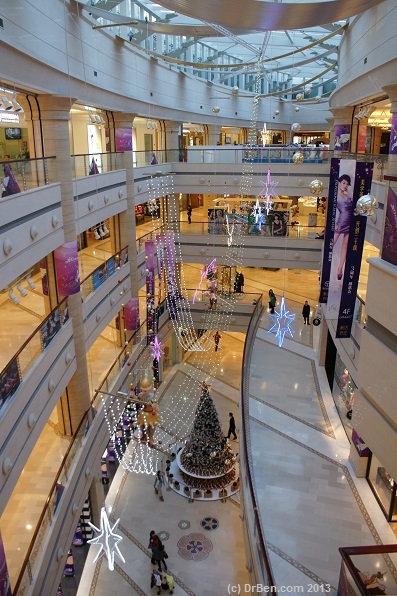 Among things it is home to the largest watch boutique in all of China. 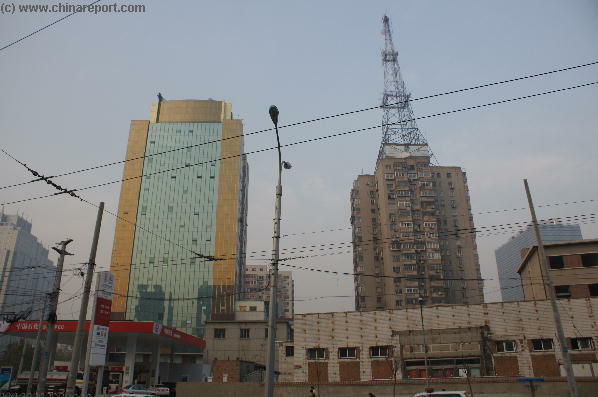 A few last hints of the Chaoyang of the recent past as seen in these buildings along Chaoyang Outer Street, just north of The Place Mall (Photo: November 2004). 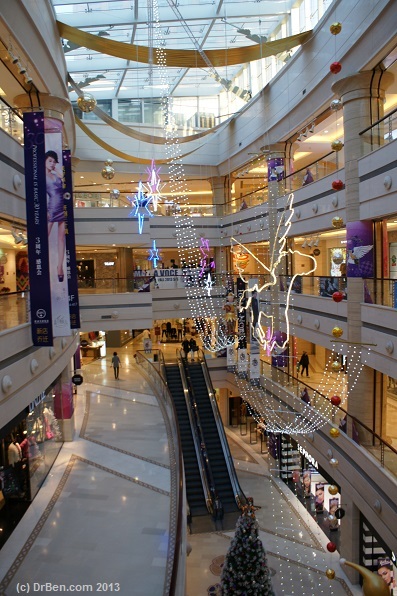 Finding the The Place Mall in the large Chaoyang District should not prove too difficult, even for first time visitors to the city and area. Although in the past the Chaoyang District was not well connected to the city through the subway / metro system, since the choice for Beijing as an Olympic City and Chaoyang as the economic engine of it, all of this has changed. the subway sytem, but a third and 4th line, pink and yellow adding many welcome connections within the district. 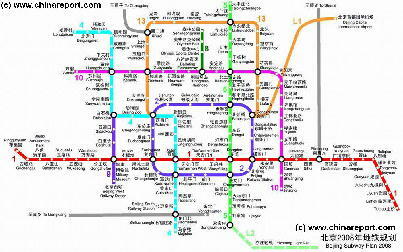 To get into the Chaoyang District from the Central City one can either travel through the Red Line passing through Jianguomen Station, or travel via the Blue Line and get off at either Jianguomen Station or Chaoyangmen Station. 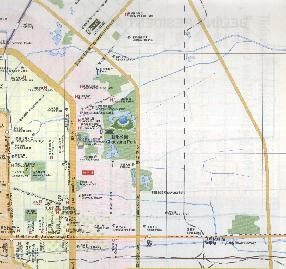 Google 3D Map of walking route along Jianguomen Outer Street in South Chaoyang, as described in the Text. Use this schematic Map to get an idea of the various locations in the CBD and Chaoyang District. - Click Map for FULL Version !! across the street from Xiu Shui Street, better known as Silk Alley. Once you have located the Silk Alley building, travel north on the road adjacent the Silk Alley Building, which is Jianhua Road, to walk up to The Place. The Place itself is as its name suggests, indeed rather spectacular. The more so given the situation in this same district but a few years ago. 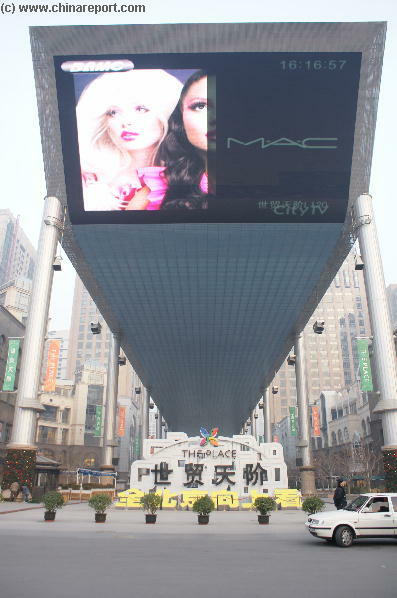 To begin with, The Place advertises itself as none before in Beijing by means of a truly massive LED sky screen. It is one of the largest LED screens in the entire world, occupying and lighting up not merely the front of its pedestrian walkway, but spanning its entire length. Already spectacular in daytime hours, The Place dominates space along Jianhua Road once nightfall turns the sky to dark. It is one of the must see sights of Chaoyang today. In addition, The Place can boast a grandiose architecture, apart from the screen complemented by huge atrium. The Giant LED Screen at The Place during normal days in 2007 & 2010. The screen goes all the length of this walkway. Once inside one can shop in luxury as at some other places in Beijing, however The Place would not live up to its name if it had more in store than the average Mall. The place is definetely upscale and trendy. Therefor, among things, The Place is prides itself on being home to the largest watches and clocks boutiques in all of China. The stores products are spectacular to say the least and it is certainly worth your while to have a browse around inside. Famous brands like Spanish "Zara", Canadian shoe retailer Aldoâ had their first and flagship store in Beijing at The Place. And apart from them, there is much more. Naturally, there is a Starbucks" available, a welcome relief for any passer by. Then there are many more such as clothing brands Potato & Co., Folli Follie, Miss Sixty, Energie, Puma, Adidas, Nike, Promod, and classy girly outlets such MAC makeup, Jessica, Chaterhouse, Swarovski and the Swiss Perfumery Shop. But The Place is not merely for shopping and buying jewelry and clothing. Apart from the earlier mentioned Starbucks there are plenty of special places to visit and enjoy one of the surprising menu's and tastes found at The Place. comes on every 1 hour for about 15-20 minutes from 7 pm to 11pm. You Tube Video: The Largest LED Screen in China at The Place in Chaoyang CBD, Beijing. for leisure, and that in a City of 18 million, one has to reserve the window seats in advance. Give The Place and the Jaguar a call? See the bottom of page for address and telephone info. For anyone on a more normal budget, or just visiting as a tourist in Beijing, let it be clear: one need not actually do any shopping at The Place to pay a visit. But, not only is the screen a must see, the overall architecture is worth your while. Furthermore, The Place stands at easy walking distance just North of the Silk Alley building another must visit site in Chaoyang District. Anyone in it for the modern architecture might also think about hiking further up north along Jianghua road to see another small marvel of modern architecture, one of the Soho Buildings belonging the now famous development company that helped made Beijing and Chaoyang Big. There are several SOHO Complexes within Chaoyang, but that is another story. You Tube Video: The Largest LED Screen in China at The Place. Five Minute Show. Security personal and visitors dwell around the fountain in front of spectacular marble facade of The Place (Photo: July 2007). A long line of ricksaw drivers awaiting upscale shoppers, mainly women, at The Place. 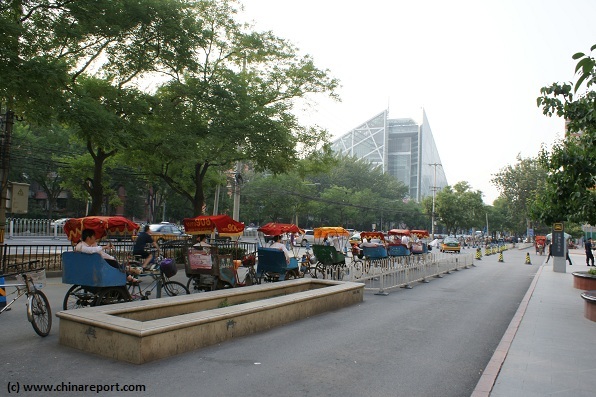 Due to the rediculous car density in Chaoyang rickshaws have become once again the fastest and most comfortable mode of transport in between shops (Photo: July 2007). well off in the Chaoyang District, it is also a redoubt for expat mommies, and this for a very good reason. A good tip for visiting parents with young children is to have a break for mom, and drop of the Kids at Yu's Kids Island. 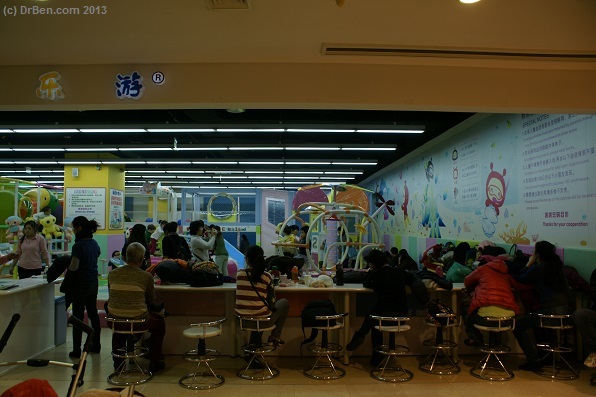 Yu Kids Island is an indoor play space, which one can find on the 4th floor and it is a safe and convenient place to drop of the small ones while having a coffee and enjoying the stores. Yu's can even boast an international environment, so why not? They might even learn something new. will charm them. 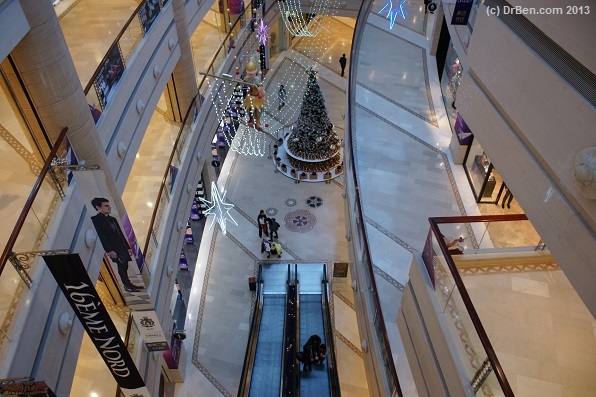 In fact, apart from the described features and its elite status, it is in the end just another Mall. During daytime, the screen, which measure a whapping 7.500 square meters (about 200 meters in length and 30 meters in width) is turned to a more passive mode showing merely short clips and advertisements while leaving the skyway switched off. The screen by the way was not built in mainland China but delivered by Optotech from Taiwan. Front of The Place at Jianhua Road in Beijing (Photo: November 2007). voyeuristic mood can hover around the Mall and sneak peak at whoever is shopping, but that might be embarassing, and at any rate involves a lot of walking. Better yet to linger comfortably around the fountain at the front gate, always a comfortable spot in the hot and humid summer in Beijing, and keep an eye out for the line of rickshaws that is usually parked upfront. If you're lucky some especially big spender will stride out, followed by several store staffers carrying boxes to the patiently awaiting rickshaws, who can then have the pleisure of ferrying the whole loot off to somewhere else. It is quite an enjoyable sight. At other times the place is quiet and peaceful and not many visit. The busiest hours are always in the evenings when locals get off work and love to dine and browse around the malls for fun. Address: 9A Jianhua Road, Chaoyang District Beijing. With a GPS tracker one cannot miss ! than as a flashy mall and trendy outing destination. It was designed by one Jeremy Railton, who was also the designer for the current largest world electro screen, which can be found in Las vegas, Nevada, U.S.A. The Place, a Mall without virtually devout of shoppers not long after opening and off season in November 2007. 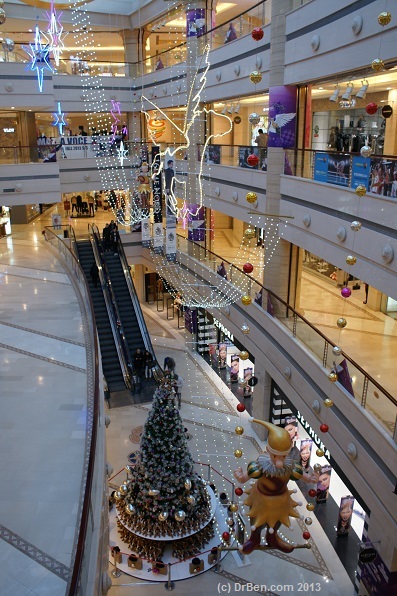 Christmas decorations in the pre-Christmas shopping period in December 2013 at The Place. 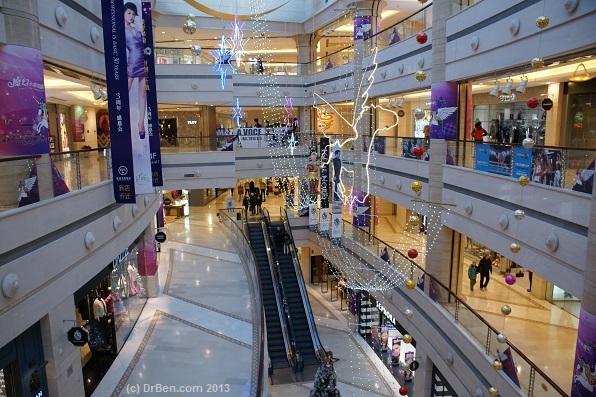 Photo Gallery: Christmas decorations at The Place Mall in December 2013. Exhausted Moms hang at the waiting bar, some napping, at the childrens day care center in the south wing of The Palace Mall (Photo: December 2013). A look down over the balustrade inside the south wing of The Place.